I have spent many years trying fruitlessly to get my email under control. Back when I worked at Microsoft, it was common that I would have a few thousand read messages in my Outlook inbox, and that when a message dropped below the bottom of the screen in the default view, chances were greater than fifty percent that I would never reply to it. I always felt that I was swimming in a river of emails, rather than email being a useful productivity tool, and if I left it for just a few hours I’d feel besieged by what was in my inbox. I tried following the Getting Things Done methodology, but it felt like exchanging anarchy for authoritarianism. So I’d muddle along as best as I could, trying to keep afloat, using a complex set of rules to divide my emails into multiple folders and crossing my fingers that I didn’t miss anything critical. 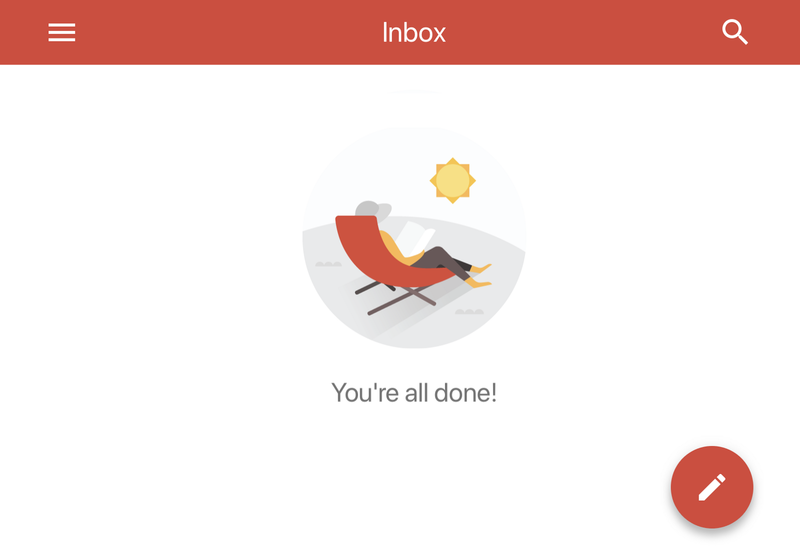 Since joining Google in late 2017, I’ve managed to not only occasionally hit inbox zero (no messages in my inbox), but I routinely go home each day with an empty inbox. I no longer wonder what critical messages languish “below the fold”, and I know what is outstanding at any given time. To be clear, I don’t make any claims of a universal panacea or innovation that doesn’t originate elsewhere, but I finally have a simple system that is working really well for me. So I wanted to share my approach, adapted from a few different sources and borne out of 20+ years of failure, in the hopes that it will help others. As we start the New Year, it’s a good time to review and clean house — perhaps this will inspire you to do so! You’re probably on a ton of mailing lists and discussion groups, whether you’ve been forcibly joined to them or voluntarily added yourself. I’m not going to tell you to unsubscribe: there’s probably lots of useful information that helps you get your job done. But do partition them from your inbox, since they are likely neither directed to you personally nor do they require immediate follow-up. Separate them into an area where you can graze through them at your leisure. And here’s the radical step: I have just one folder where all my mailing lists go. Not one folder per mailing list. 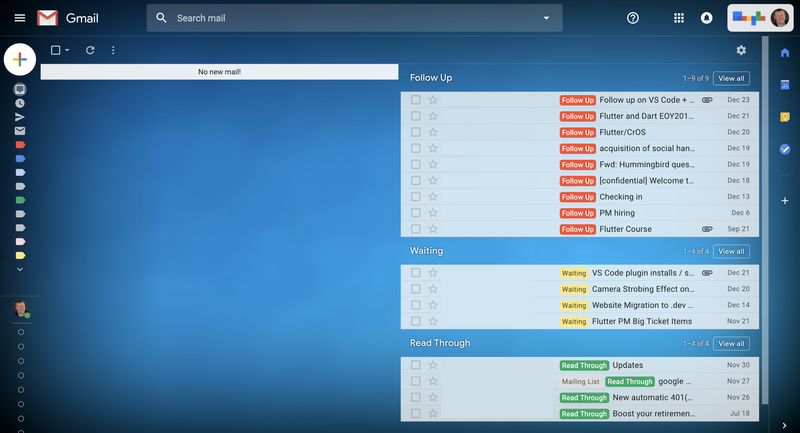 One folder for all mailing lists. I hadn’t realized until I made this change how much time I spent flitting from one folder to another, desperately trying to keep each of them empty like Lucy and Ethel at the chocolate factory. My filter is super-simple: if my email address isn’t directly mentioned in the addressees, then it goes straight into the Mailing List folder. Lots of emails come into this folder, and I’m comfortable to just scan through it. For mailing lists that are extremely chatty but only peripherally interesting, I’ll switch my membership to a digest (Google Groups makes it easy to receive daily or batched summaries). That helps me scan the folder for more interesting items, which I’ll do a few times a day (but not more often). Read and Archive: most emails don’t require any follow-up action at all: they’re sharing useful information and all I need to do is scan through it. In Gmail, simply pressing e archives it, moving it out of my inbox. Follow up: If I need to reply to the email and it will take longer than a few minutes, then I hit v to move it into a separate folder called Follow Up. This contains mails that will require a more thoughtful response. When I have a little more time, I’ll work my way through mails in this folder and reply to them. I work hard to keep this to no more than twenty items: if there are more, then it tells me I need to be delegating more, allocate more time to responding to others. And often it’s a signal that I’m falling into the trap of micro-managing rather than empowering others. But it’s surprising how easy it is to deal with one of these in 10–20 minutes of downtime between meetings. So long as I follow this step, I’m in charge of my inbox. Triaging doesn’t take long — just a few minutes — so I can do it regularly throughout the day. Moving emails out of the inbox is no good if it simply hides them from sight. It’s critical that they’re visible. So I rely on the Multiple Inboxes feature in Gmail to ensure that three key folders are in view: Follow Up, Waiting and Read Through. I’ve explained Follow Up above: it’s for things that need longer attention. I use Waiting to track emails where I’m waiting on someone else’s reply; if I need them to take action. And Read Through is a specialized kind of Follow Up — for emails that contain useful information to review at my leisure, but where there’s no immediate follow-up required. To file an email as Waiting or Read Through in Gmail, simply use the l shortcut to label the item, and then start typing the label. I make a point of labeling Follow Up, Waiting and Read Through with traffic light colors to make sure that it’s easy to visually differentiate. My work inbox. Sender names redacted from the folders on the right for privacy. Turn on conversation view so that messages are threaded by default. This helps ensure that you keep your follow-up actions together. If you need to fork a conversation, make sure you change the Subject line so things you might need to follow up on don’t get merged with general back-and-forth conversation. 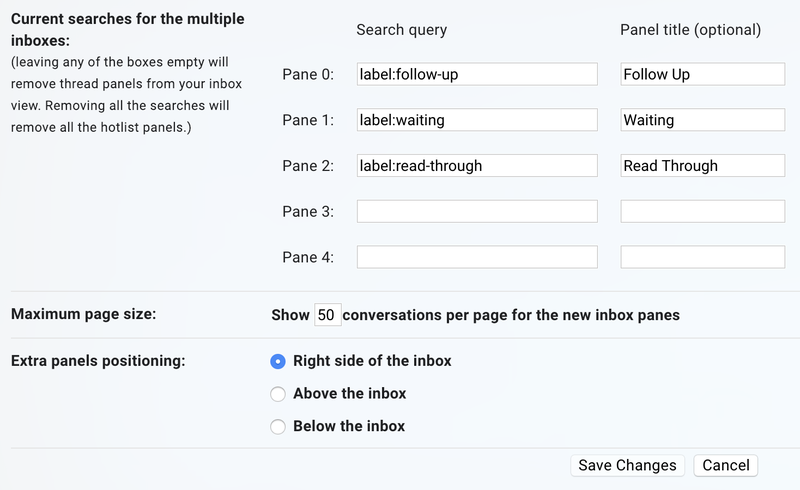 Turn off Priority Inbox (set your inbox type to Default) and deselect categories other than Primary: you don’t need any of this now that you have a lean, clean inbox! This approach has been working for me for over a year now. I’ve not had to declare inbox bankruptcy at any point, and I’ve always left work for the evening in the knowledge that while I have plenty of tasks left undone, I’m at least in charge of my inbox rather than the other way around. That said, no system is perfect. In particular, my approach doesn’t do anything to address time management. It doesn’t magically give me extra hours in the day; I’m still occasionally late for meetings because the ten minutes between the reminder and the meeting itself is just long enough for me to forget about it; and messages on sites like LinkedIn still sometimes slip through my fingers. Lastly, particular thanks to Laura Mae Martin, Google’s executive productivity expert, whose internal training and materials were the inspiration for much of this content.